Chris Hanburger thought the door had closed on his attempts to get into the Pro Football Hall of Fame- so he was pleasantly surprised to get the nod as a Seniors candidate in 2011. It’s a great story really. 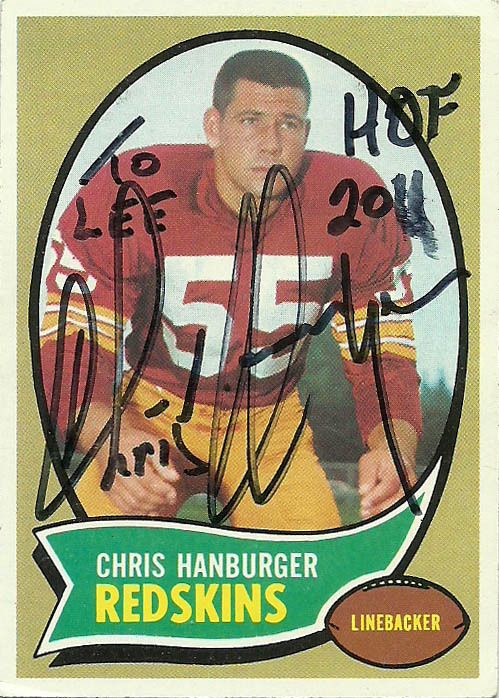 Chris has been so good to the TTM community and fans for years, so it was long overdue that the Redskins linebacker received the honor after his accolade laden career concluded. I mean, who knows if much was expected from the little known 18th round selection out of North Carolina in 1965. Regardless, Chris put together a remarkable 14 year career with 9 Pro Bowl nominations (1966-1969, 1972-1976) and All-Pro Honors (69, 72, 73, and 75) setting the standard for professional play at outside linebacker, durability (135 straight games started), and as a member of the Redskins’ Over the Hill Gang. I had been wanting to get Chris’ autograph for a while, but had to find the perfect card to get signed. I had no clue that he had a Topps 1970- but considering that he was playing during that period, I should have assumed that there was this great golden era card. It was nice of him to personalize and put an inscription to the card- but it’s too bad that the inscription was slightly smudged.